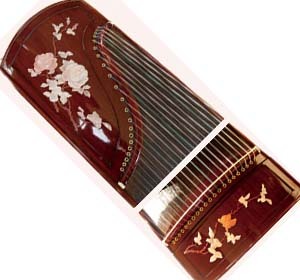 Guzheng (古筝), also simply called Zheng (箏), is a Chinese plucked zither. It normally has 16 or more strings and movable bridges. Guzheng (古筝) has been popular since Era of Warring States (481 BC to 221 BC) and been one of the most commonly played Chinese music instruments in China. Guzheng (古筝) is the ancestor of several Asian zither instruments, such as the Japanese koto, the Mongolian yatga, the Korean gayageum, and the Vietnamese đàn tranh. Here is the list of Guzheng (古筝) MP3 in our media library.